- Open Monday to Saturday 10 -4pm. Closed Sunday. 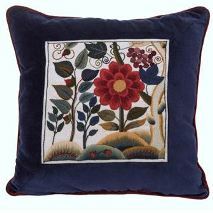 Explore the world of Brazilian Dimensional Embroidery with this Primavera kit. 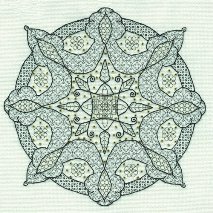 This complete kit includes "Primavera- the Art of Brazilian Embroidery" book and a wash-away preprinted design on white polycotton with the essential rayon threads . We do have stock of book and printed fabric separately . 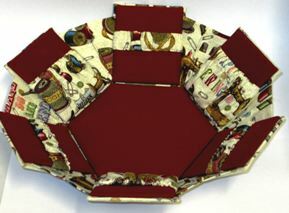 Design size is 16.5" x 5.5", fabric is 24 x 14". Gorgeous scissors - the best quality you will ever find. Guard them well! Sharp to the very point.gold plated handles . Book onto one of our regular classes and workshops - lots to choose from. We are always offering more classes so please check regularly . We do put them on facebook and instagram too . Book online or phone 01904620587 or email vikingloom@vikingloom.co.uk . Do not use our email contact via website . .Equally , if there is something you would particularly like to learn , let us know and we will try and help . 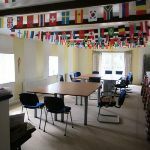 If you are travelling from afar and would like to know if there is something you can join in with during your stay up here please ask . romy and team at viking loom . Open 10 - 4pm Monday to Saturday. Since we moved two and a half years ago ,we have been able to considerably expand our fabric section - we have a large room dedicated to quilting cottons . Moda, Stof , Benertex, Henry Glass ,Indigo ,Lewis and Irene ,Timeless Treasures are some of our suppliers . We really search for first class fabrics in gorgeous clear precise prints that work well for quilting . 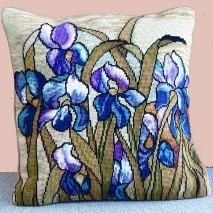 This quality fabric also works well for general sewing - come and have a look if you can . We have a fair selection on our website but not everything ,so if you are looking unsuccessfully ,please email or ask and we will trty our best to help you find the fabric . 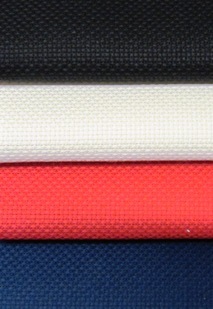 We have begun to stock some lovely dressmaking fabrics -- wools, very fine cotton , broderie anglais .... again all first class quality and very competitive on price . 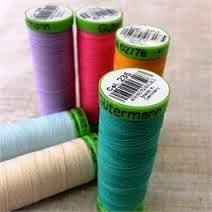 A selection of Gutermann threads for quilting and sewing. Kits and canvas - We have a range of contemporary, exciting designs, as well as something more traditional. 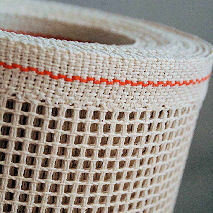 Or can supply canvas and wools if you wish to design your own. We stock Anchor and Appletons wool listed under " Threads and Wools for Needlework" , or come to the shop and pick your colours in person. DOVO Solingen finest quality scissors. Very special indeed - we had a lady in the shop recently that bought a pair of these over 20 years ago and they are STILL going strong - the best scissors you will EVER buy! they are produced near dusseldorf in germany using the solingen steel manufacturing process . this is a bit like comparing champagne to sparkling wine a few years ago . the process produces a very distinctive high grade steel blade and perfect point .They are lovely to use . You can still lose them ! 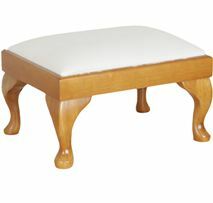 A new range of solid wooden footstools and firescreens. 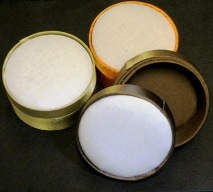 Made to measure is also available if you don't see the size you require. These stools usually take three weeks to come as all made to order . Phone or email us for more details.we have marked where we have stock in each size . Merino wool for use in wet felting and needle felting. A treasure trove of glass beads of different sizes and shapes in a wide range of colours. All of our beads are of fantastic quality - the majority of our glass beads are sourced in the Czech Republic. 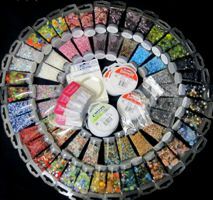 Glass beads from Jablonex in the Czech Republic - bugles, mixes, hearts, precious metal and much more. Gorgeous range of Preciosa crystals. We have a vast range of jewllery findings of every possible type plus lots and lots of tools to make the job easier. 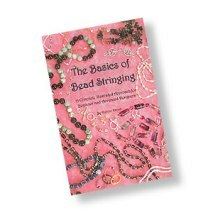 Dimensional and Elizabethan embroidery, beads, threadwork and Christmas project books. A little bit of everything to give you inspiration. 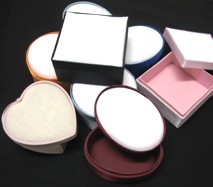 A range of good sturdy boxes contructed of heavy weight cardboard and then covered in coloured satin. Large or small available. 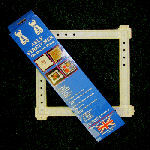 Perfect for mounting small scale masterpieces! The range of colours previously available has been reduced by the supplier - very sorry. 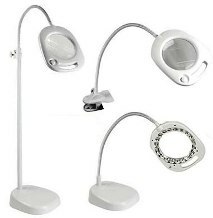 What we have on web site now is in stock now . Christmas projects. We have great ideas for crafty natured people. You never know what you will find? Cashmere, wool blanket, silk gauze, AIDA, trigger cloth and tapestry canvas. Click on the picture to get back to the homepage.